www.MergerIntegration.com, including but not limited to articles, books, software, webinars, tools, and presentations, are owned by PRITCHETT, LP and protected by United States Copyright Law and International Treaty provisions. 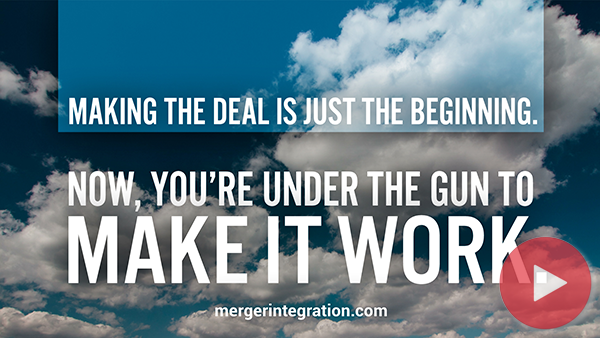 A Corporate Subscription entitles up to 100 employees of the Corporate Subscriber to use all the Materials on www.MergerIntegration.com for five years. A Corporate Subscriber has the right to store Materials downloaded from www.MergerIntegration.com in a shared repository (i.e. an intranet, Sharepoint, Dropbox, etc.) for usage by up to 100 employees for five years. A Corporate Subscriber may send up to 10 people to the Merger Integration Certification Workshop free of charge during the five-year period. Individual and Corporate Subscribers may not share the Materials with other companies, vendors, or consulting firms. Please call Joe Aberger, EVP of Pritchett, at 214-239-9600 to learn more.